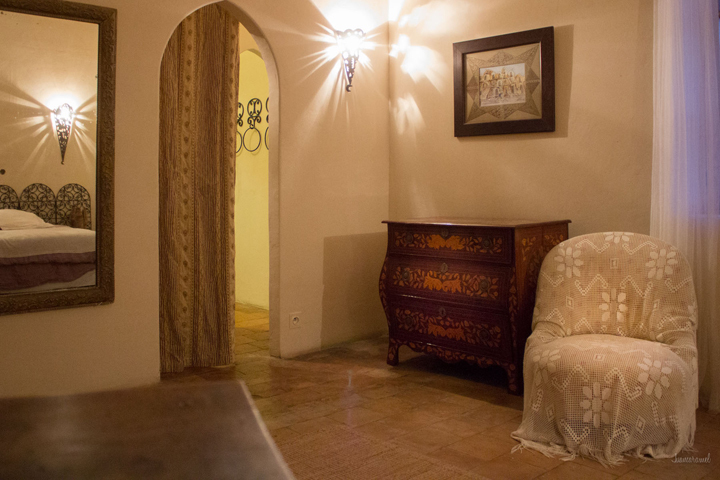 On the first floor, a large and beautiful bright room with Moorish decor, and its small lounge. It faces due south and offers a nice view of the garden. 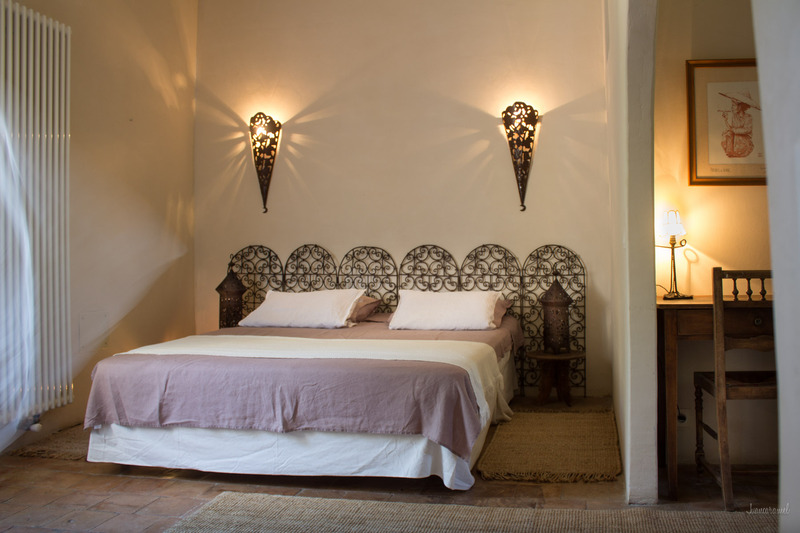 40m2 suite for 1,2 or 3 persons, equipped with a double bed 160x200 (queen-size) and a single bed 90x200. Good quality bedding and natural linen sheets. 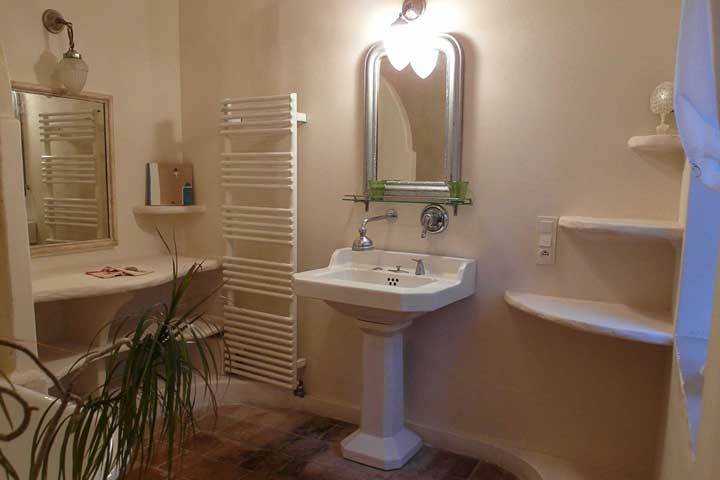 Large bathroom with bathtub. Separated toilets. Welcome tray (electric kettle (with tea, coffee, herbal teas), hairdryer, etc). Bath towels (fouta) are provided for the swimming pool. Mid season (from March 30 to June 15 and from September 15 to November 4). High season (from June 16th to September 15th and the weekends of first of May and Assumption). These conditions are intended for the exclusive use of the reservation at the Moulin du Rossignol. Requests for availability or reservation can be made by email, telephone or post. We confirm your reservation by email. The stays are confirmed upon receipt of the deposit (30% of the total amount of the stay), deductible from the invoice at the end of the stay. The cancellation of a reservation will only become effective after confirmation by e-mail of its taking into account by the Moulin du Rossignol. Cancellations less than 7 days before the start of the booked stay will result in the retention of the deposit and will not give rise to any compensation. In case of interruption of the stay, whatever the cause, the stay remains due in its entirety. In the event of cancellation by the landlord, the latter will inform the customer as soon as possible and will reimburse the deposit and/or make a relocation proposal. The balance, consumptions and additional services will be paid at the end of the stay. Payment method: cash, bank checks, holiday cheques, bank transfer, Paypal. Unless prior agreement, we welcome you between 4pm and 9pm. Outside these times, we ask you to inform us of your arrival time. In any case, the availability of the room is not guaranteed until 4pm. On the day of departure, we ask you to vacate the room by 11 a. m. at the latest. We are sorry, but we do not accept pets. The owner declines all liability for theft or personal injury occurring in the property. The swimming pool is open to guests at all times. Children must be under the constant supervision and responsibility of an adult. The dispute resolution authorities will be those of the place where the service is provided.